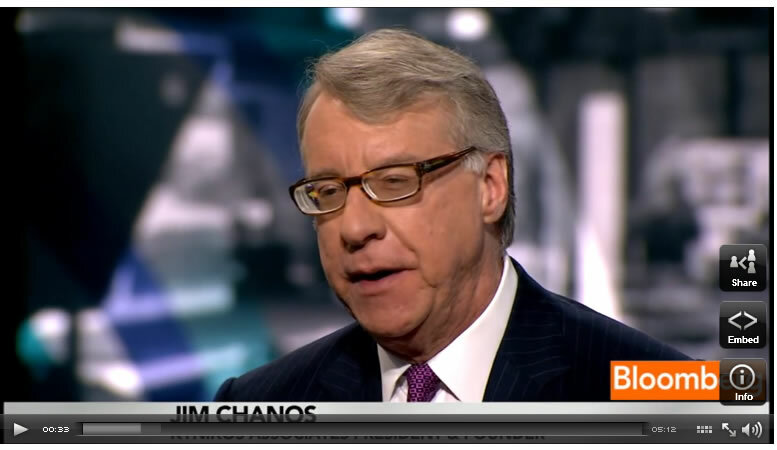 Billionaire short seller Jim Chanos, founder of hedge fund Kynikos Associates Ltd., spoke to Bloomberg TV's Betty Liu this morning about China's banking system and outlook for the Chinese economy and real estate market. "I think we probably came back a little bit more bearish....Our concerns about what we saw in Australia: an economy clearly tied to China has hitched its wagon to the tail of the tiger. In terms of the general complacency, what we heard over and over from investors and clients and potential clients is, 'yes, yes, there are some excesses, but the government will figure out a way. That the government is this all-knowing, omniscient basic entity that will not prevent me from losing money." "[The Chinese government] doesn't [have money], and that's the problem. The banking system in China is extremely fragile, and that's one of the messages we wanted to get to people." "In fact, because what happened the last two crises, in '99 and '04, when non-performing loans went crazy in China without even a recession, the Chinese banking system was not re-capitalized like ours was, it was papered over. Going into this credit expansion, Chinese banks are sitting on lots of bonds from the so-called asset management companies set up in 1999 and 2004, and they are keeping them on the books at par, at full value. In the case of Agricultural Bank of China, which we're short, those restructuring receivables are equal to over 100% of their tangible book. The Chinese banking system is built on quicksand, and that's the one thing a lot of people don't realize. When they talk about the foreign reserves of $3 trillion, what everybody forgets is there's liabilities against that." "Everybody seems to think it is a free and clear open checkbook. It's not. That is what we have been trying to tell people. Focus on the lending system over there, because everything occurs through the banking system." "Property prices and transactions are really beginning to decelerate. We saw that starting in August, that's continued into November. Transactions are down 40% to 50% year over year in the tier 1 through 3 cities. Prices are down. In some cases, we've seen riots in sales offices, where people are amazed that prices could actually go down. There's lots of indicators on the side. There's a growing sense that the Chinese government will ease. We point out that credit this year will grow between 30% and 40% of Chinese GDP. If that's tight, I'd hate to see it ease." "At some point, we will cover our shorts. [The scenario would be] a system where the banking system would have to be recapitalized again, most likely. You would see a flood of RMB in the system, and a realization that the growth by fixed asset model has got to change. Mr. [Stephen] Roach and others are convinced that the Chinese customers will pick up the slack. And at some point, he and she will. But the transition is going to be the real tough part. And right now, the consumer continues to decline as a percent of the Chinese economy. That is, I think, flies right in the face of what most people think will happen." Copyright © 2011 Bloomberg - All Rights Reserved Disclaimer: The above is a matter of opinion provided for general information purposes only and is not intended as investment advice. Information and analysis above are derived from sources and utilising methods believed to be reliable, but we cannot accept responsibility for any losses you may incur as a result of this analysis. Individuals should consult with their personal financial advisors.